Saturday, March 24, students from Parkland, Florida and throughout the country gathered in Washington DC and other cities across the U.S. calling on Congress to enact stricter guns laws. Dominican Sisters of Houston and Houston Dominican Family members joined thousands of students and adults marching in downtown Houston. The sisters also hosted the annual Pax Christi Texas Conference on March 24. 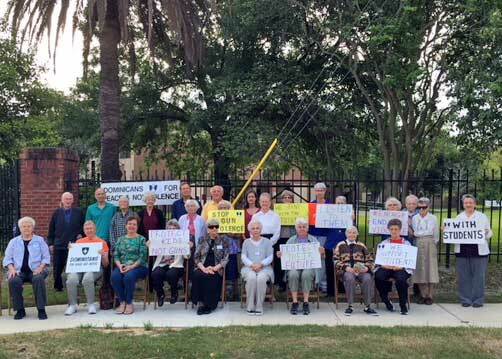 Prior to the Conference Dominican Sisters, members of Pax Christi and friends gathered for 17 minutes of silence at the entrance to the Dominican Motherhouse to be in solidarity with the students and their supporters. Following the vigil, participants moved to the Center for Dominican Spirituality to learn from Paul Chappell strategies for Waging Peace. West Point graduate and Iraq War veteran, Paul speaks from personal experience of a way to become a person of peace and how to teach others to become people of peace. He began the conference by examining humans’ basic psychological needs which counter Maslow’s theory of physical needs. For example, it is the need for meaning in our lives that steers us to look for water and food for survival. Focusing on the need for respect and how being disrespected leads to conflict and on a larger scale to war, Paul reminded us we must first find that peace within ourselves for there to be peace in our world. In the afternoon, he focused on ways to come to peace. He names our need in the 21st Century as Peace Literacy. “Just as literacy in reading gives us new information . . . literacy in peace also gives us access to new kinds of information such as solutions to our national and global problems, along with solutions to many of our personal and family problems.” He lists seven forms of peace literacy: 1) our shared humanity, 2) the art of living, 3) the art of waging peace, 4) the art of listening, 5) the nature of reality, 6) our responsibility to animals, 7) our responsibility to creation. He reminded us that by listening to each. It is in sharing our stories and listening to the stories of others that we come to an understanding of the other that leads to respect for his/her human dignity. With Paul’s emphasis on feelings of self-worth and the need for respect it seemed apropos that Cherry Steinwender, founder and Executive Director of the Center for the Healing of Racism was given the Pax Christi Peace Award. Cherry focuses on the principle that racism violates the oneness of humanity. She founded the center in 1989 with emphasis on personal growth, healing, and the exploration of ways to heal racism. Over the years the center has offered many programs and workshops, including a “Dialogue” Racism workshop, to inform and overcome racial tensions and prejudices. Literacy in peace allows us to put our weapons away and learn to live with people of various ethnic and cultural backgrounds.